Recent years have seen a rapid decline in the UK textile and clothing manufacturing industry and those companies that have survived have been forced to outsource or move production offshore to low labour cost economies as demands from retailers for lower prices puts margins under pressure. The way in which these companies manage their design capability in a global supply network becomes critical, because of the increased lead times that offshore manufacturing presents. In a dynamic, fast moving sector, where quick response and agile supply chain management is the recipe for success, design has become an increasingly important capability in the search for competitive advantage. The purpose of this chapter is to address the role of design in global supply chain risk management. 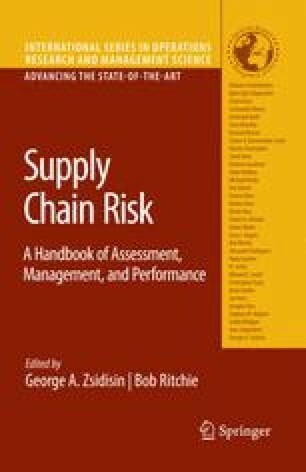 This chapter recognises the strategic role of product design in global supply chain risk management. It provides a framework for design-led risk management and thus presents a case for recognising design as more than a creative function in the supply chain but as a platform to manage risk in supply chains. Whilst there is growing literature in the field of supply chain risk there is less empirical evidence providing practical examples of managing supply chain risk. Design-led risk management offers a novel approach to mitigating supply chain risk. The empirical research reported in this chapter is specific to the clothing manufacturing and fashion retail industry, although the findings support industries and supply chains where product design has an integral role and plays an important part in the competitiveness of the final product. There would be benefit in extending the research into other sectors. The chapter begins by summarising the key trends in the textile and clothing industry and discussing one of the major trends of global sourcing. We then introduce the research methodology, which is based on an indepth longitudinal case study of a major UK retailer. Data collection tools included observation of supplier meetings/workshops, semi-structured interviews and access to key company documentation and archives. This is followed by a detailed case analysis of the company from which we propose strategies for managing risk in a global market. Elliott, L (2005) “Bra Wars: Europe Strikes Back.” The Guardian, 26 August (http://www.guardian.co.uk).